I first met Katsuji Tanabe when he was executive chef of 26 by Shiloh’s, a kosher dairy restaurant in Los Angeles. Katsuji is half Japanese, half Mexican. He was born in Mexico City, attended Le Cordon Bleu in Pasadena for his culinary training, and did his culinary internship in Japan. Talk about a diverse food background! Though he’s not kosher, he landed a gig at a kosher restaurant– 26 by Shiloh’s– and found that he enjoyed the challenge of the kosher laws. It forced him to get creative and come up with interesting flavor combinations that he might never have considered before. He became a kosher cooking expert by default, and I am continually impressed with his culinary creativity. A couple of years ago Katsuji opened his own place, Mexikosher, in the Pico Boulevard “kosher corridor” of Los Angeles. He saw a need for traditional Mexican food in the area, and boy did he deliver. How do you make Mexican food without cheese, you might ask? Amazingly, you don’t miss the cheese here, or the pork. 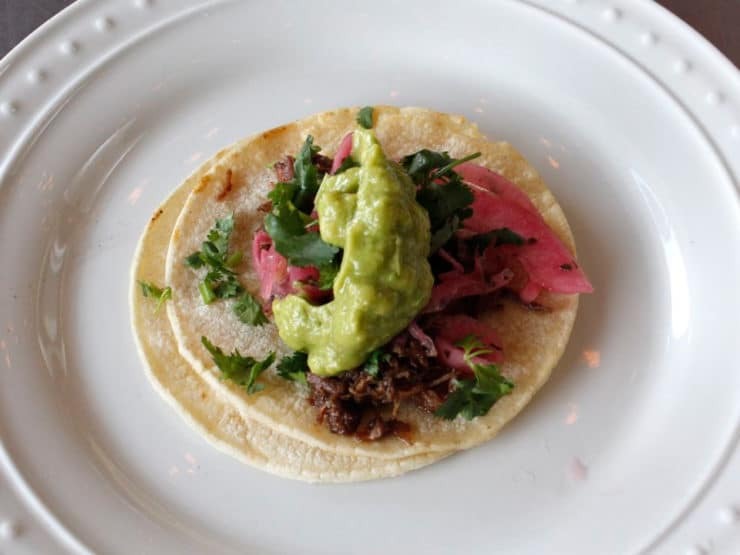 Imagine kosher carnitas– slow-cooked brisket braised in duck fat, cooked till falling apart, tender and shredded. 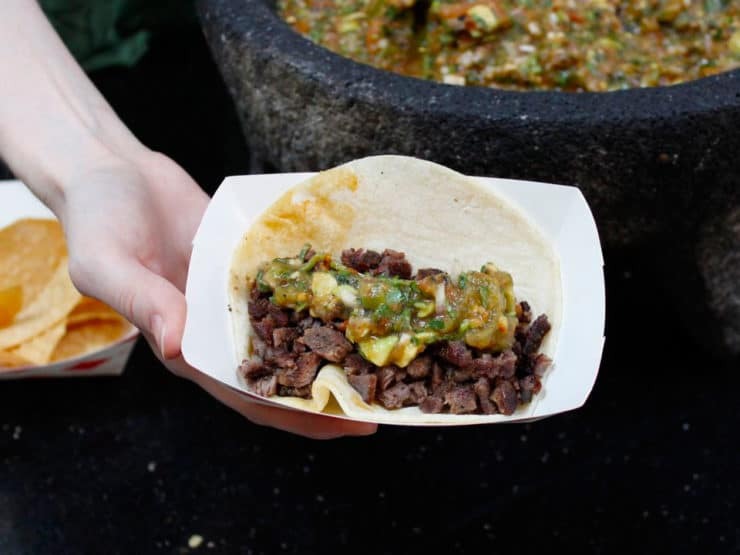 Stick it in a warm corn tortilla, top it with pickled onions, chopped cilantro and avocado salsa– trust me. Nobody will be asking where the cheese went. It’s a total flavor bomb. 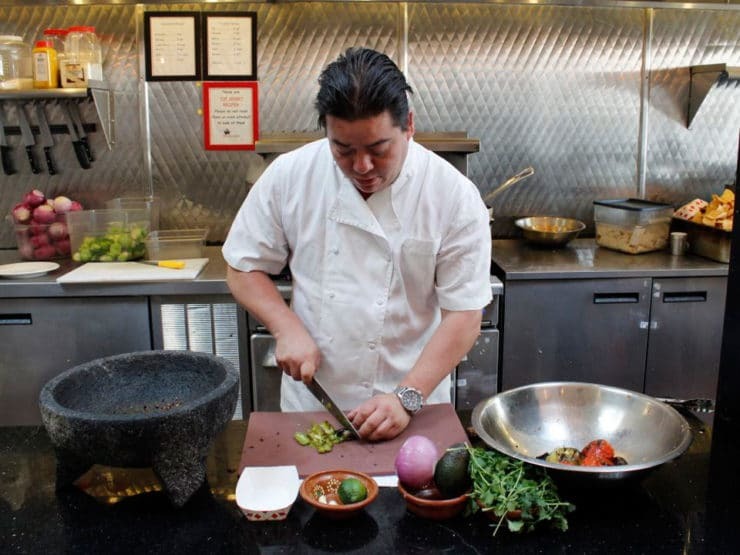 I stopped by Mexikosher this weekend and asked Katsuji to teach me a recipe for Cinco de Mayo. He walked me through his assembly line. 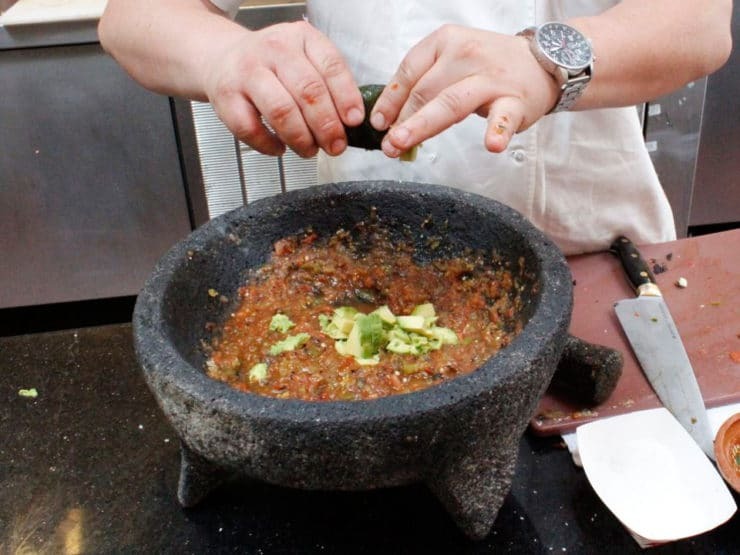 Everything here is made in house– fresh salsas, fresh guacamole, fresh toppings made from scratch. He made some delicious tacos for me and my assistant, Ashley. I took the carnitas pictured above. Ashley is vegan, so he made hers with his wildly popular cactus salad, avocado and freshly chopped salsa fresca. We were both very happy campers. It was Quatro de Mayo yesterday, but I totally celebrated like it was Cinco. I threw caution to the wind and ate a bunch of amazing Mexican food. The diet officially starts tomorrow. 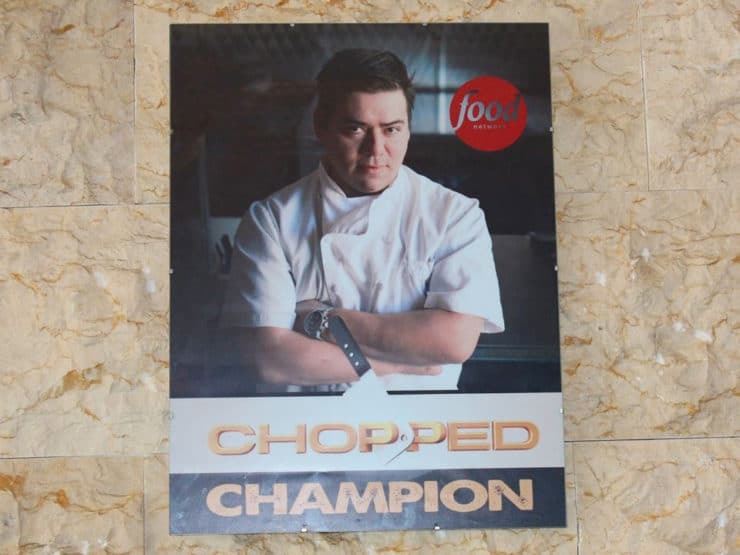 You might recognize Katsuji from an episode of Chopped that aired last year on the Food Network. Guess what? He won! Katsuji shared his Salsa Taquera recipe with me, a smoky grilled salsa with tomatoes, tomatillos, chipotle pepper, jalapeno and avocado. 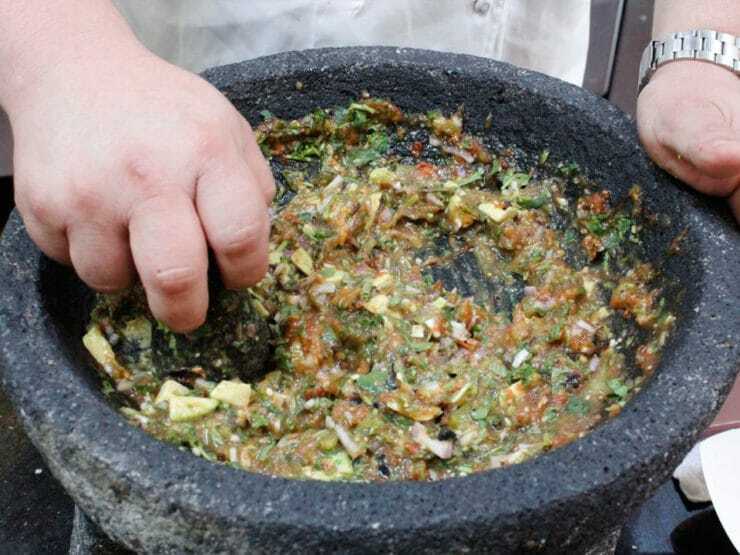 He made it in a traditional molcajete (pronounced mole-kah-het-eh), a heavy stone mortar and pestle traditionally used in Mexico for grinding spices as well as preparing salsas and guacamole. On the heat end of the spectrum, this salsa would be considered “hot”– some might even call it “fiery.” I adore spice and couldn’t get enough of it, but it will definitely be too hot for some of you out there. Pepper heads rejoice, this recipe is the real deal– it packs a punch. Serve with chips or ladle it on a taco. 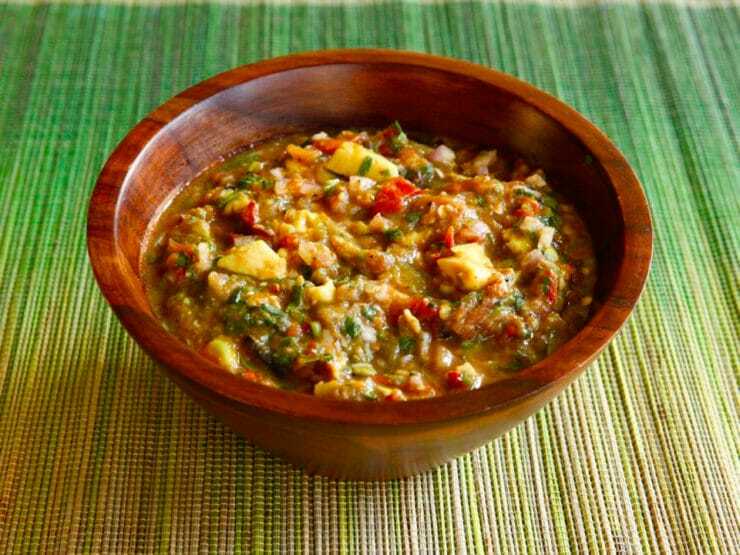 Katsuji calls it a “Sunday salsa,” traditionally made on a non-work day when folks are relaxing and grilling together. It does not keep well, so it’s best to make it just before you eat it (in other words, it’s not considered a weekday salsa that will keep in the fridge for a few days). After 4-5 hours it starts to lose its pizazz, so make it, eat it, and enjoy it. Savor the flavor and toast Chef Katusji with a margarita. Happy Cinco de Mayo! For more info on Mexikosher visit their official website and Facebook page. 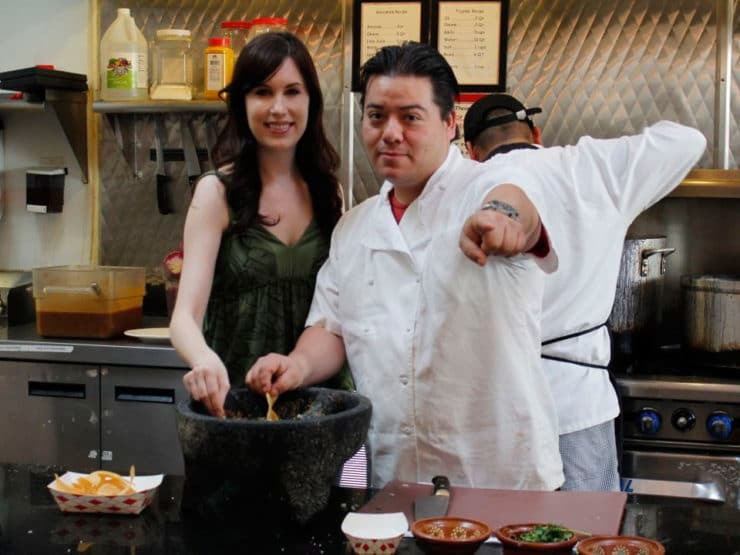 For Chef Katsuji’s salsa recipe, read on! Brush the tomatoes, tomatillos and jalapeño with a little vegetable oil (any veggie oil will do, or use nonstick cooking oil spray). 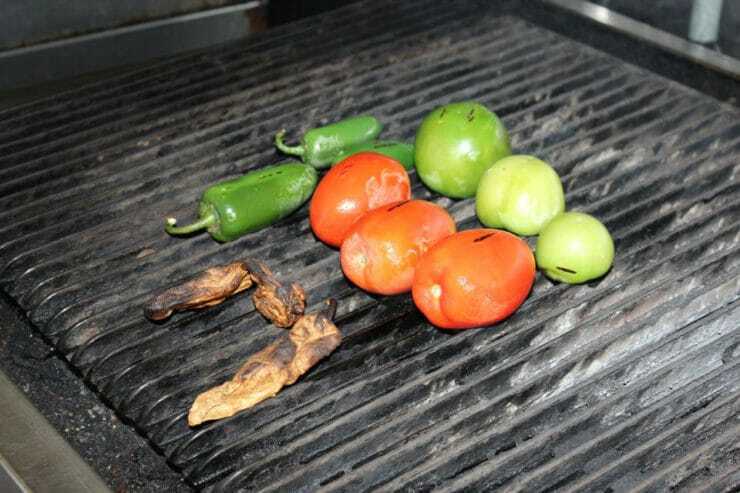 Place the tomatoes, tomatillos, jalapeño and dried chipotle on a char grill. Let them grill for 5 minutes, turning once during cooking, till the outsides have dark charred grill marks, the tomatoes are soft and juicy and the jalapenos have roasted and softened. Cut the stem off of the dried chipotle and mince it very fine. Stem the jalapeno and dice it small. Dice the tomatoes and the tomatillos. 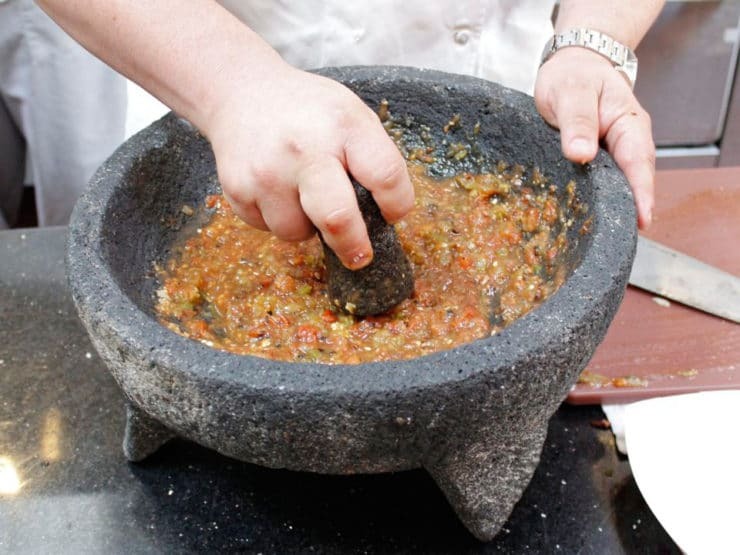 Place the chopped ingredients in a food processor or molcajete. Rub the sliced garlic together with a dash of sea salt till pulverized, then add to the other ingredients (if using a food processor, add garlic slices and a pinch of salt to the processor, no need to rub them). Rub the ingredients in the molcajete, or pulse a few times in the processor, till ingredients are blended with a chunky texture. Add the diced red onion, diced avocado and chopped cilantro to the other ingredients, along with 1/4 tsp sea salt. Continue to rub the ingredients in the molcajete or carefully pulse a few times in the food processor until well mixed (not pureed!). Leave the mixture chunky, but make sure that you stir it well so all ingredients are blended together. Add lime juice and additional salt to taste, if desired. The salt and the lime juice really enhance the spicy flavors, so don't be afraid to add a bit more till the flavors pop. Serve with chips or on top of tacos. We added some to a steak carnitas taco. Delish! Remember, this salsa is extremely spicy-- not for the faint of heart! Eat it within 5 hours of making, it is best made fresh and does not keep well. Enjoy! 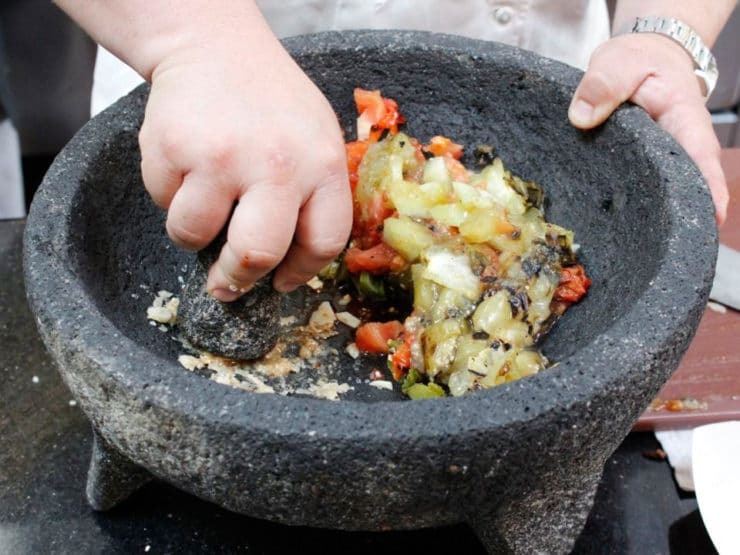 Can you tell me where tip get that exact molcajete? I love the look of it! Sounds easy…I’ll delete the heat! Selma, even without the jalapeno it will be super hot… you’ve been warned! Really am enjoying all of your posts and your web sites as well. Thanks for all you share. Two great people in a picture together. Love it!!!!! I love every single thing about this recipe. Fiery? Yes, please! Love the new logo on the website! Love it! I’m moving back to So Calif in a couple of months so I have a new restaurant to go to! You’re with one of the best!! Right Katsuji? That is the largest molcajeta I’ve ever seen. Wow!!!! I love the fact that is shares his ingredients! That restaurant sounds AWESOME – and you look adorable in this picture! Isn’t Mexikosher great Linda?? He’s so creative with his food! yes! i was just there 2 weeks ago. my cousin Lisa Rosenblatt took me there!